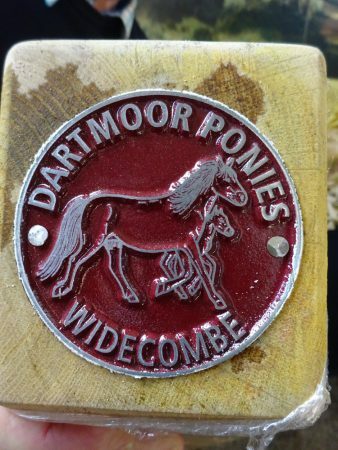 As many of you will know, as well as being editor of Dartmoor Magazine I’m also the author of a number of walking and guidebooks. 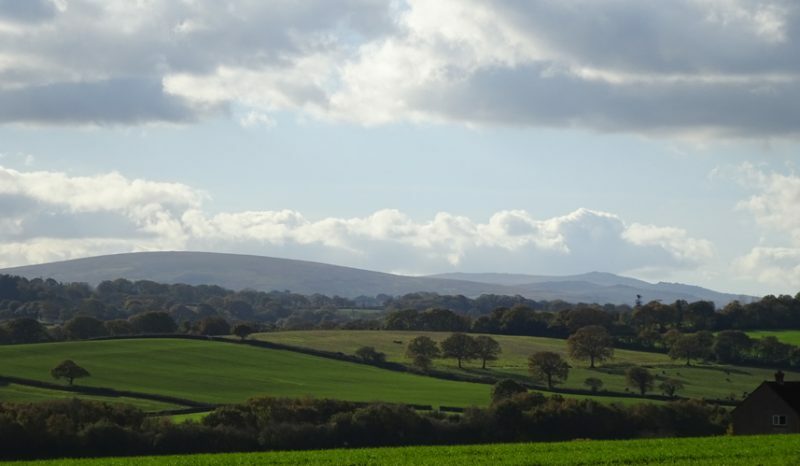 I’ve recently been commissioned to update my last book – The Two Moors Way – Devon’s Coast to Coast walk for the publishers Cicerone Press. 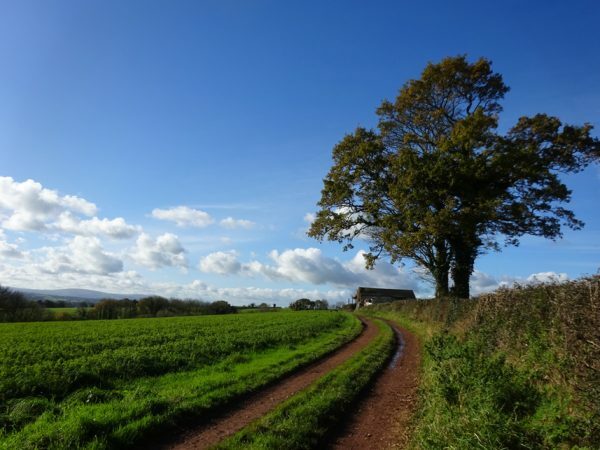 It won’t be out until late next year, but it’s an opportunity to walk the whole 117 miles across Devon (with a section in Somerset too) again, in both directions! 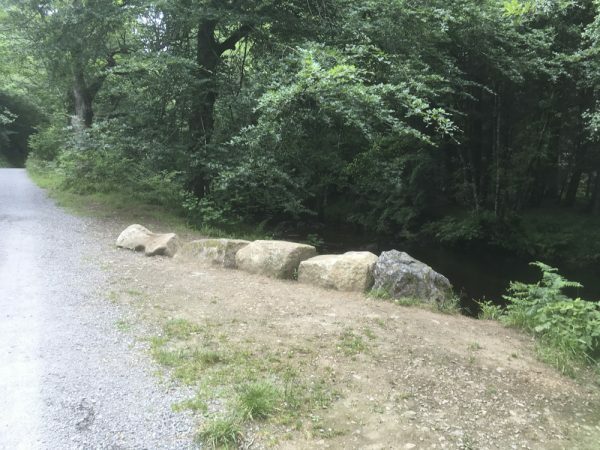 I’ve also got to write up the new low level route between Ivybridge and Scoriton, and check out the various alternative route options along the way. All good fun. 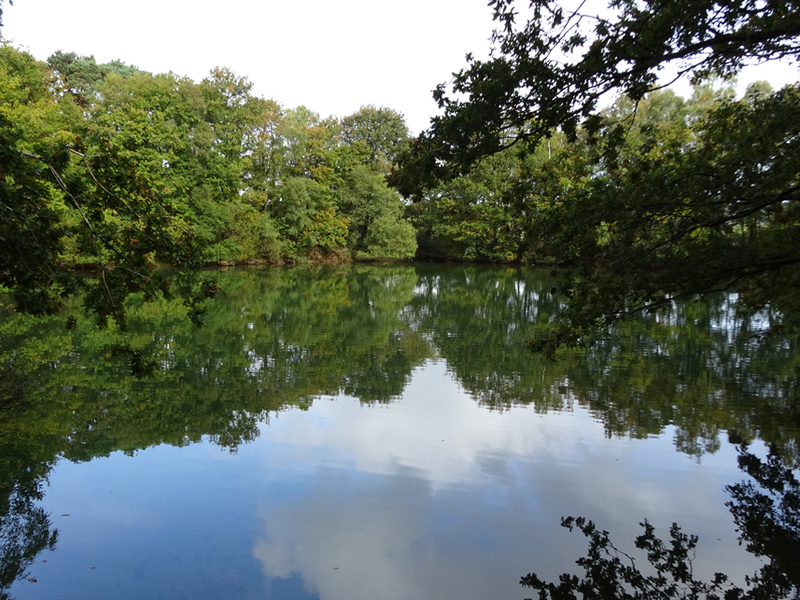 So my friend Emma and I have been enjoying some wonderful days out lately. 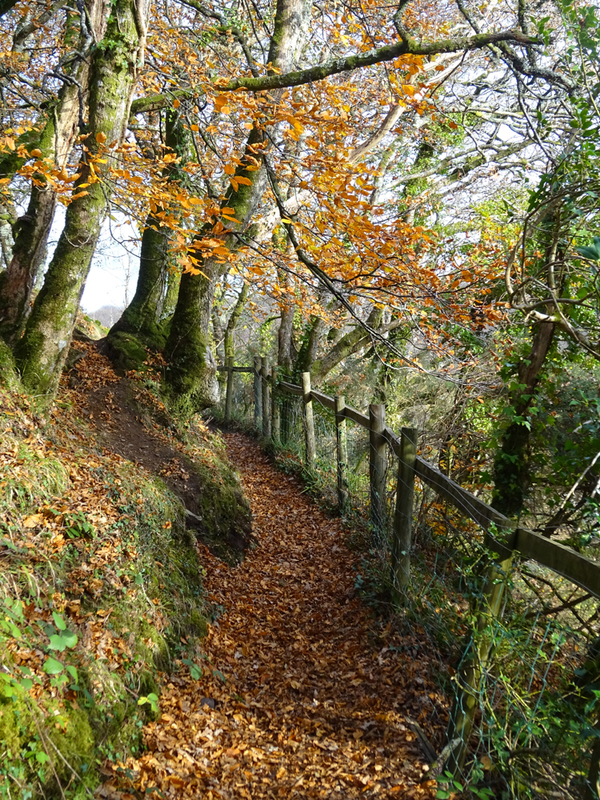 We started checking the route in Mid Devon, walking from Morchard Road towards Down St Mary and then south past Clannaborough Barton. 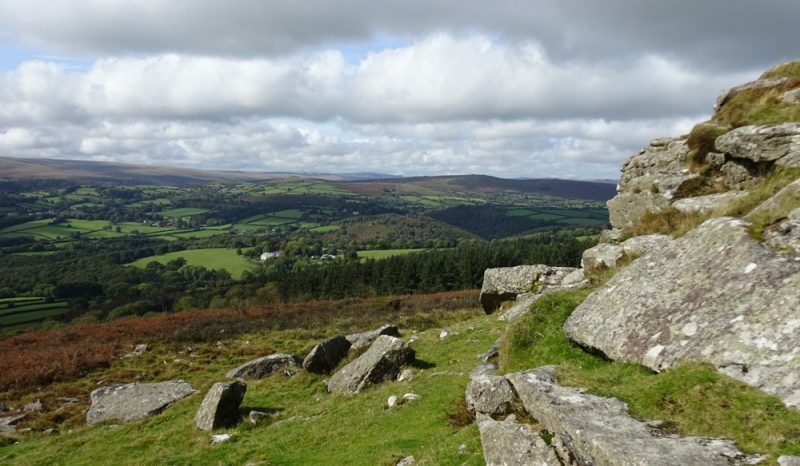 That’s where you start to pick up some fantastic views of Dartmoor’s northern slopes (see the header image too). 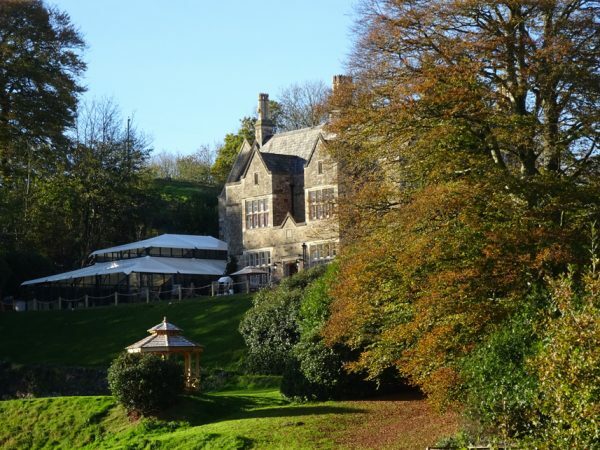 We turned around just west of Yeoford, and on the way back stopped for coffee at the recently opened and very lovely Paschoe House Hotel – a little spot of luxury and a nice break from ploughing through the muddy red fields of Devon’s heartland! 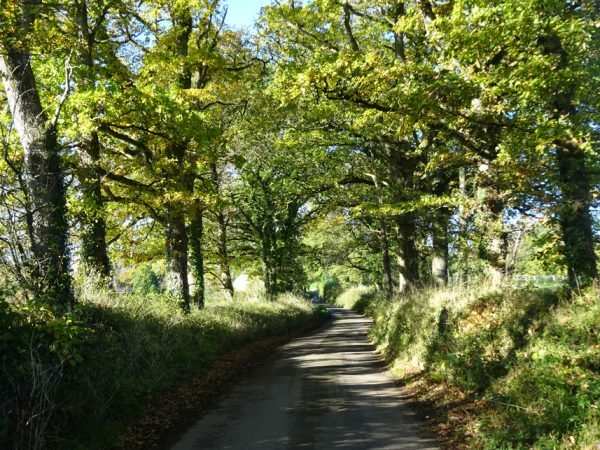 Our next jaunt saw us walking north from Morchard Road through the rolling fields and woodland tracks to Morchard Bishop, where we had an obligatory stop (and shop – coffee and cake) at the wonderful Church Street Stores (at the halfway mark on the 102-mile Two Moors Way). The trouble with these shorter days is that we invariably get back to the car in the dark! This week saw us back on Dartmoor. 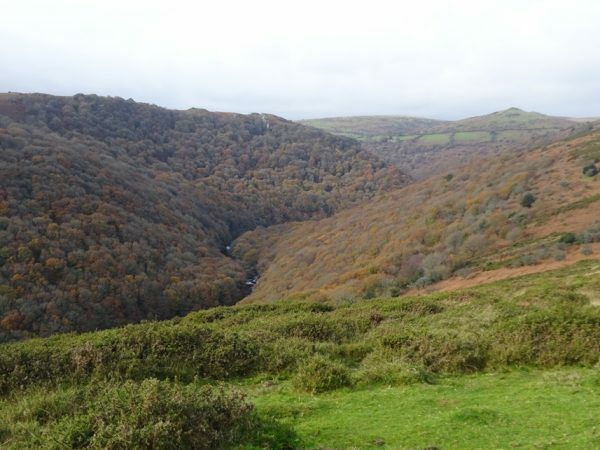 On yet another beautiful autumn day we walked from Widecombe (a short way off the official route, but we just had to stop at The Cafe on the Green…) via Dunstone Down to Jordan, then along the pretty West Webburn river to the ford at Ponsworthy. Then up across the moor towards Bel Tor Corner, via the lovely hedgebank beeches at Primm Cottage. The next section of the route – along Dr Blackall’s Drive above the wooded Dart Valley – is stunning at any time of year, but I’m starting to think that autumn may be my favourite season in which to walk it. 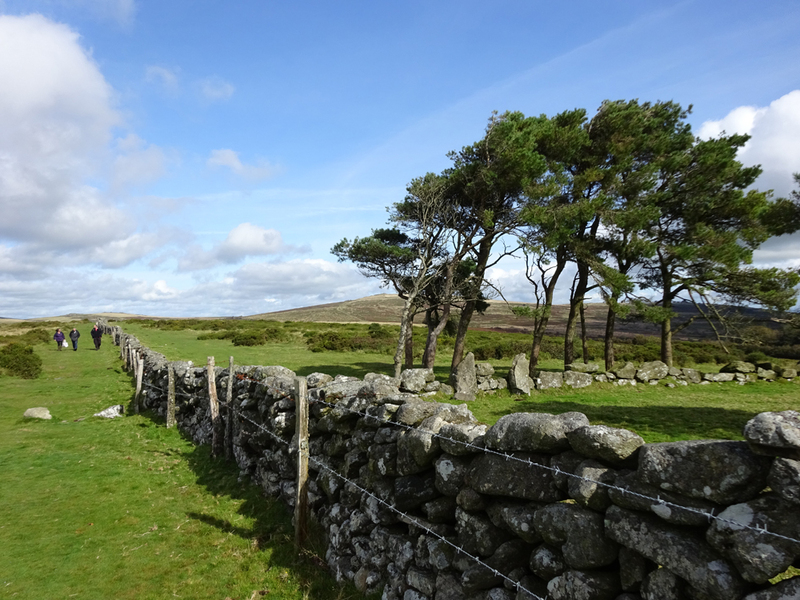 We stopped for a bite to eat at Leigh Tor –so much more extensive than it appears at first sight, and with great views towards Buckland Beacon – before dropping steeply downhill to the Dart. 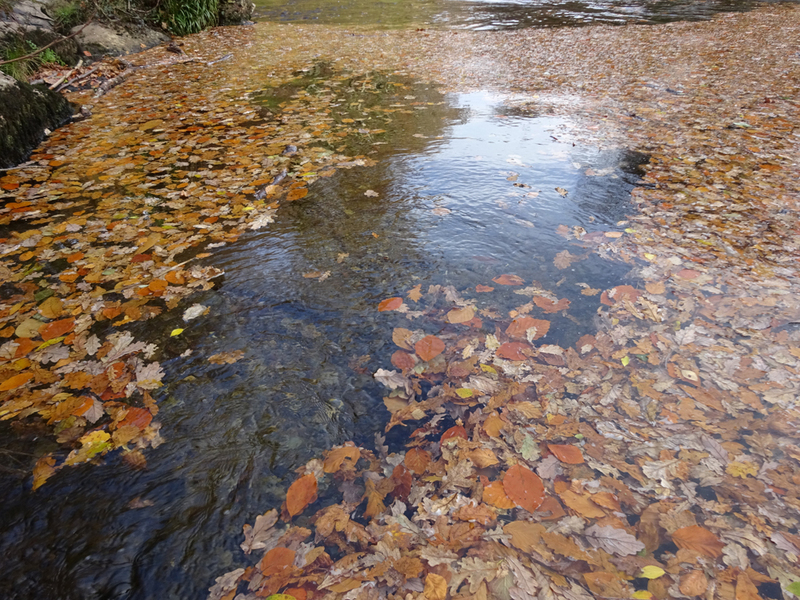 The fallen autumn leaves caught in calm spots on the surface of the crystal-clear water were just beautiful. We followed the bank of the river and crossed the green sward at Deeper Marsh – no one there for once! 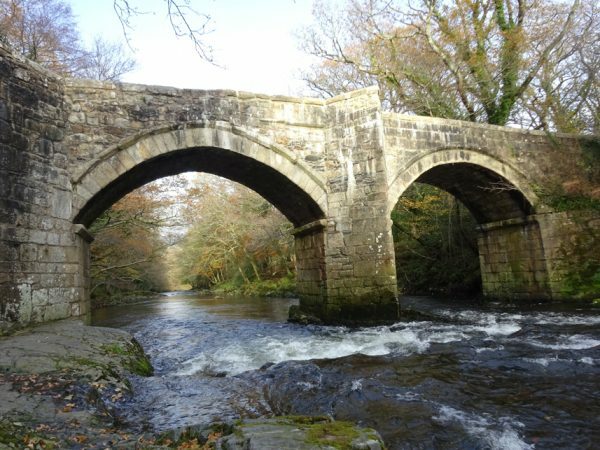 – to New Bridge, where we watched a group of kayakers for a while before turning round and retracing our steps back to Widecombe. What a glorious day to be out on Dartmoor – one of those really ‘good to be alive’ ones! 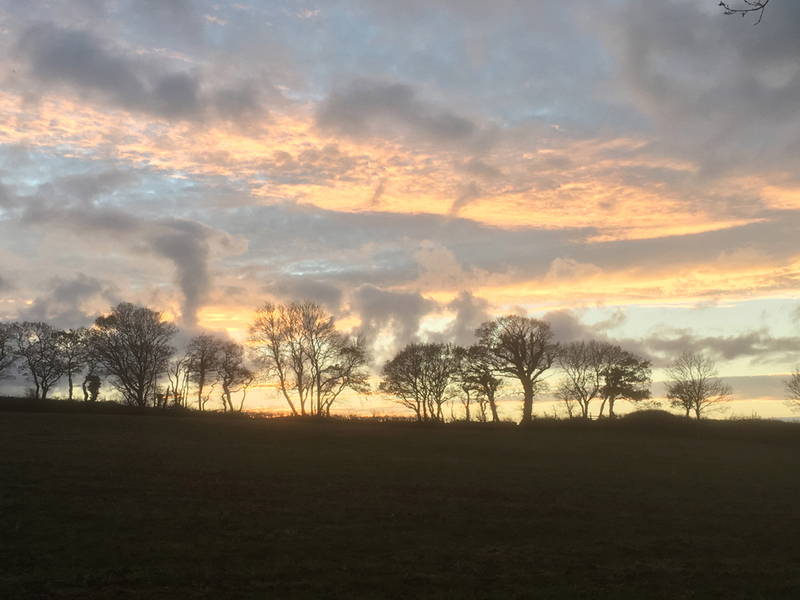 PS And yes – we did get back in the ‘almost dark’ – yet again! Alongside my role with Dartmoor Magazine I’m involved with various Dartmoor-related committees and organisations, two of which – the Dartmoor Local Access Forum and the Moor than meets the eye community stakeholder group – have held training days recently (the above photo was taken from Buckland Beacon on the MTMTE day out in late September – more of that below). 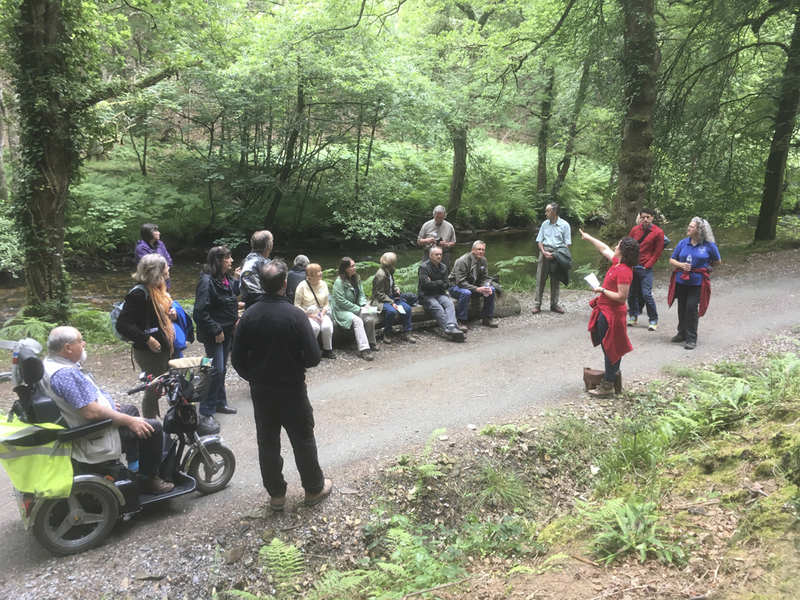 In July I went on the annual Dartmoor Local Access Forum (DAF) day out, this time joined by members of the Devon LAF. We visited Fingle Woods to take a look at developments since the woods were purchased by the National Trust and Woodland Trust in 2013. 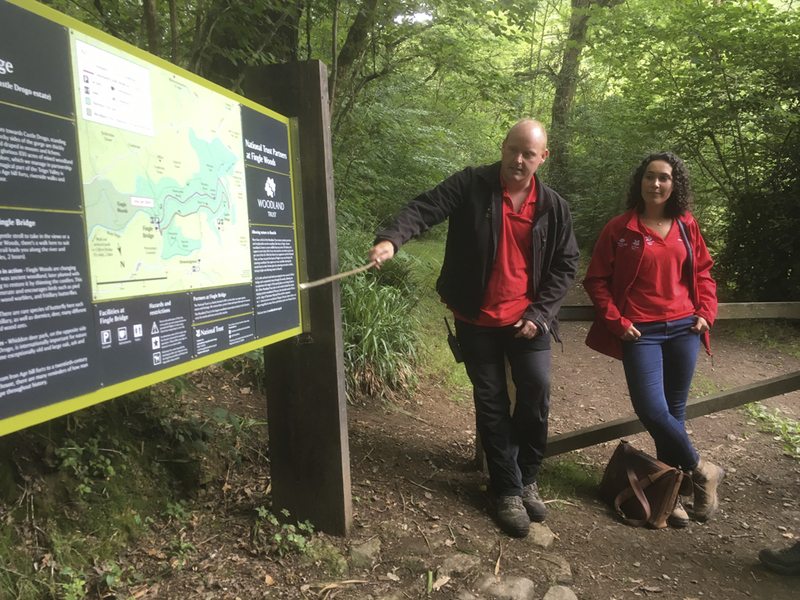 We were shown around by NT area ranger Tom Wood, and WT Community Engagement Officer Eleanor Lewis (seen below – note the new and highly informative information board, found just over Fingle Bridge). Among other works a variety of circular and linear trails have been devised, and a multi-use trail developed alongside the River Teign. 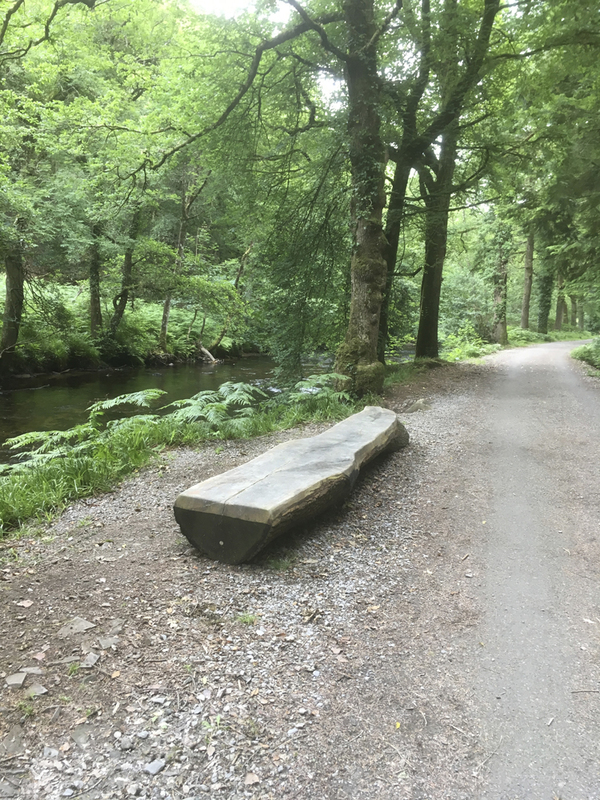 We looked at various items of path furniture (for example a tree-trunk bench, in sympathy with its surroundings) and issues such as bank erosion along heavily used stretches of the multi-use trail. 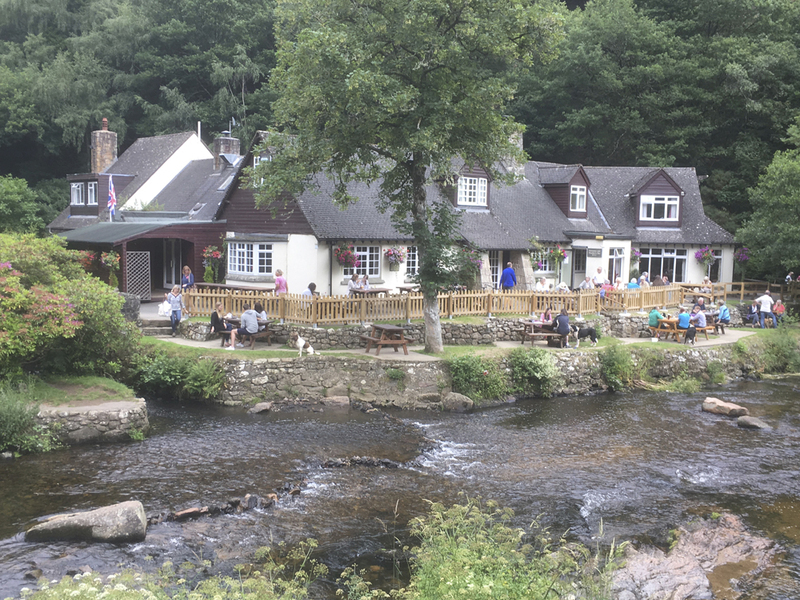 After lunch at the perfectly located Fingle Bridge Inn we spent the afternoon listening to presentations on (and discussing issues related to) the Dartmoor Way (cycle route, with plans in hand for a revised walking route), the recently relaunched Two Moors Way, the new long-distance bridleway (Cookworthy Forest to Meldon, north Dartmoor) the Pegasus Trail, and the Wray Valley Trail (a multi-use trail which, when complete, will run from Bovey Tracey to Moretonhampstead). 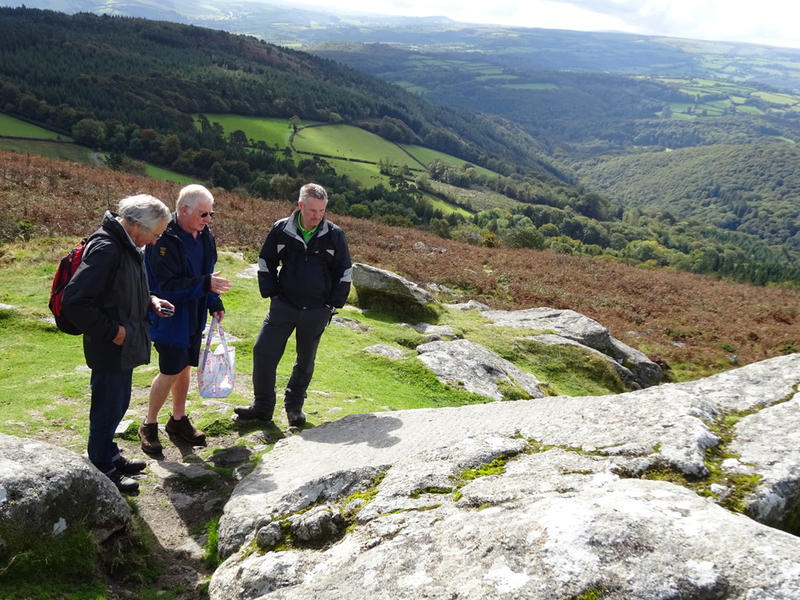 A very interesting and rounded day, looking at many aspects of user access on and around Dartmoor. Last week three members of the Moor than meets the eye Landscape Partnership Community Stakeholders Group (honestly!) enjoyed a day out with scheme manager Mark Allott. 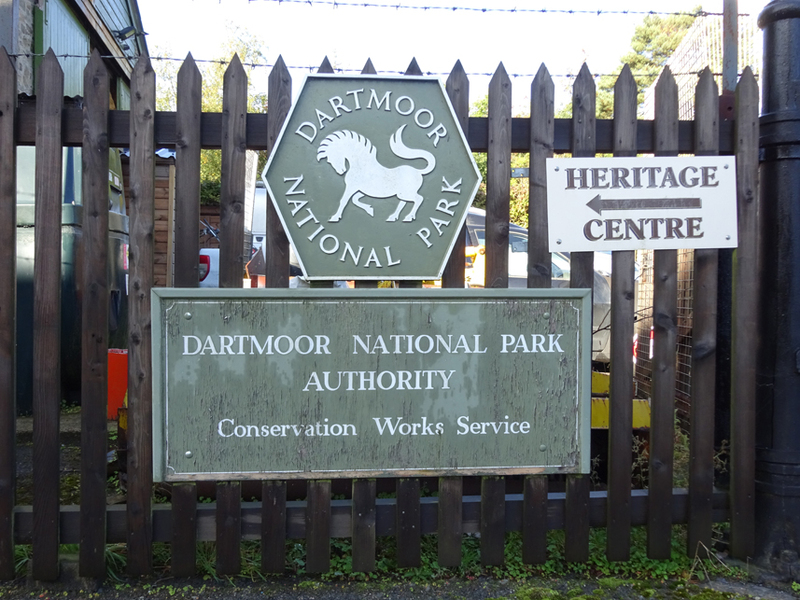 Our day started somewhere I have always wanted to visit – DNPA’s Conservation Works HQ at the former station yard in Bovey Tracey. Here we met Head of Conservation Works Jon Stones and his two apprentices, Ben and Leo (part funded by the MTMTE scheme). The next intake of DNPA apprentices is due at the end of the year. As a great lover of all things ‘signposty’ it was good to see Leo midway through creating a new fingerpost – and many finished ones propped up in the yard, waiting to be installed! 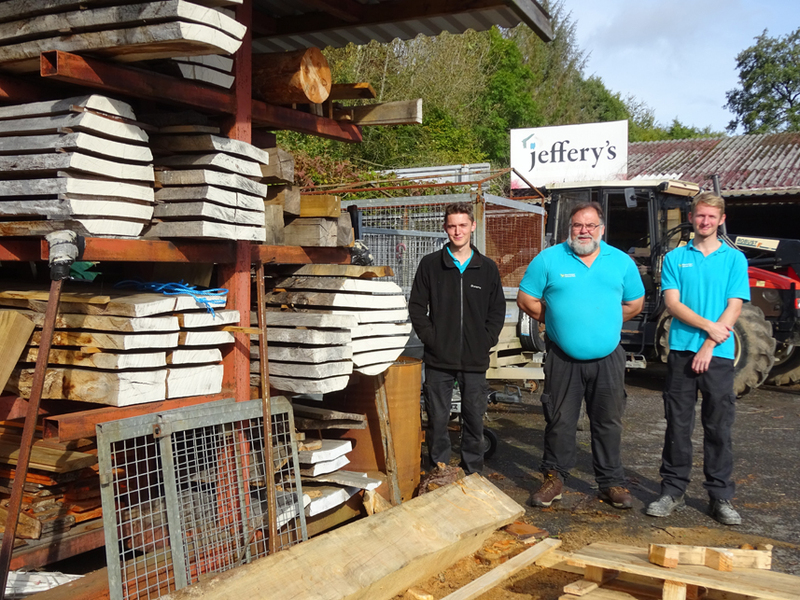 The team covers a vast range of work on the Dartmoor – ‘everything from re-puttying windows to strimming banks to making signposts and felling trees’ – and it was good to be able to chat to two enthusiastic apprentices who are clearly enjoying their training and gaining a great range of skills to set them up for future employment. Next we stopped at the middle Trendlebeare Down car park, with its stunning views over the wooded Bovey Valley. 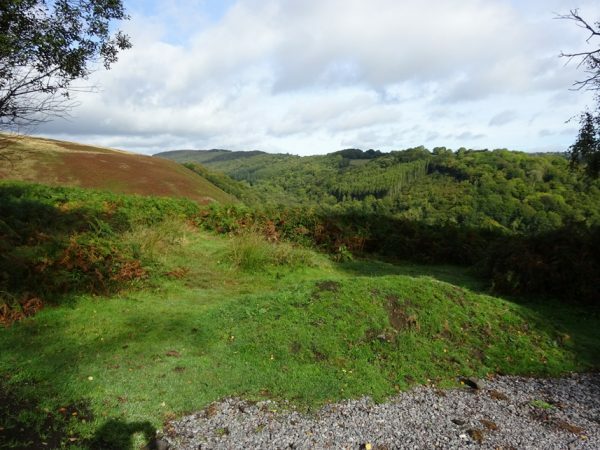 Here work has been carried out to prevent the encroachment of parking on the open moor (bunds have been established around the car park perimeter): a practical solution to managing problems associated with increasing numbers of visitors to the moor’s most popular spots. 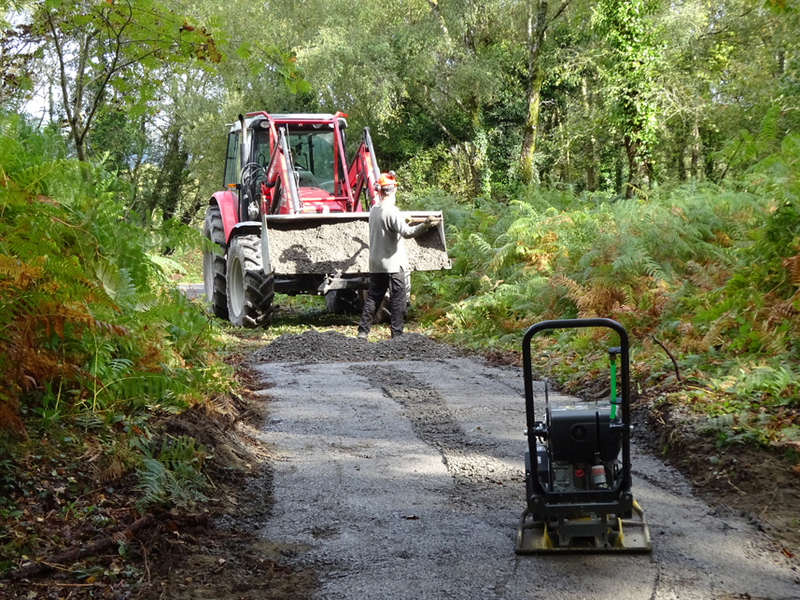 Opposite the car park a new access path is being constructed by MTMTE volunteers into the top of Yarner Wood, to link with a new multi-use trail leading to the reservoir (clearly visible on OS OL28) and new bird hide, providing opportunities to watch species in a different habitat from the rest of the NNR at Yarner. 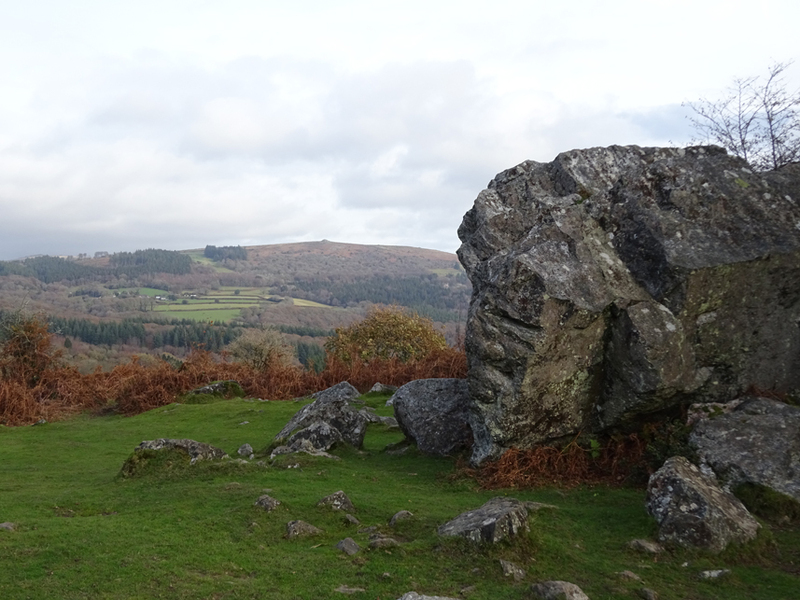 A lovely walk across the common took us to our next destination, Buckland Beacon, to view the newly restored Ten Commandments Stones, originally carved in 1928 under instruction of the Lord of Buckland, Mr William Whitely of Wellstor. 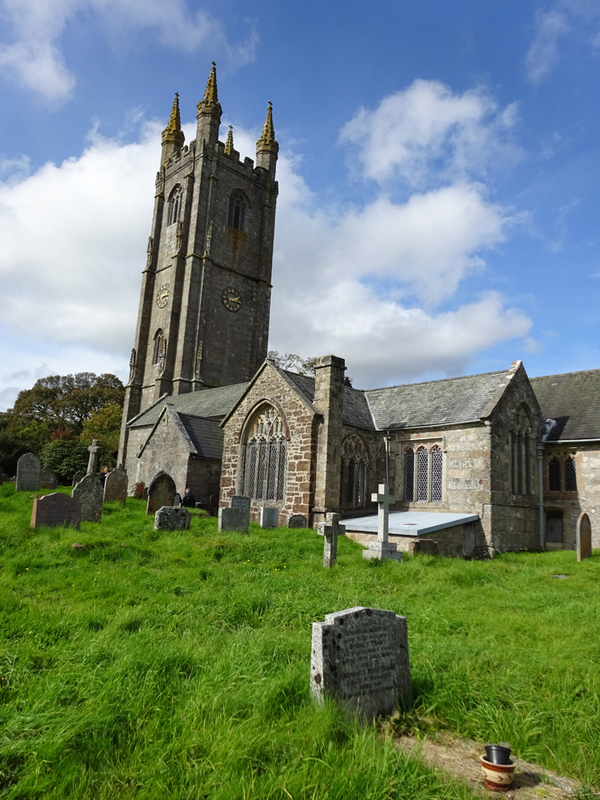 Here we met Guy and Annie Hillhouse from Buckland-in-the-Moor, who lead the restoration initiative within the MTMTE Parishscapes project (with funding too from the DNP Communities Fund). The perfect spot for a picnic on a warm and sunny autumn day – and oh! so much delicious cake! We then dropped down to Widecombe to meet David Ashman from the Widecombe History Group, who showed us a number of new informative interpretation panels that have been installed around the village and inside St Pancras Church, linking with a new leaflet about the village. This falls within the ‘Discover the Dartmoor story’ Parishscapes initiative. 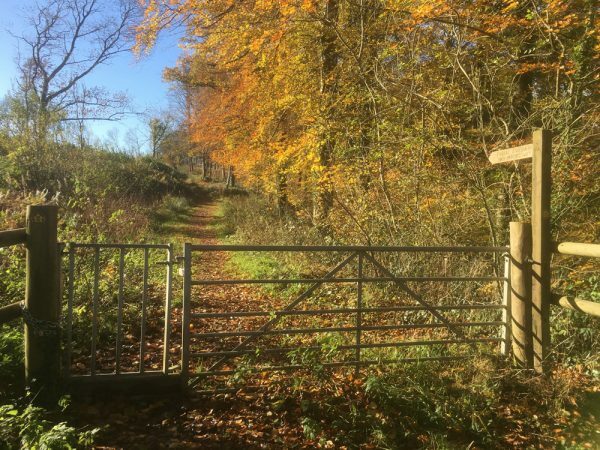 David told us about plans to install a ‘rubbing’ trail around the village (seven posts bearing an embossed motif on the top, for people – in particular children – to collect). Our last stop of the day was the DNP Visitor Centre at Haytor, where MTMTE’s Chrissy Mason updated us on plans to develop a wildlife hub there, with interpretation panels on local wildlife and birds, focusing on an area of rhos pasture that lies just behind the centre. 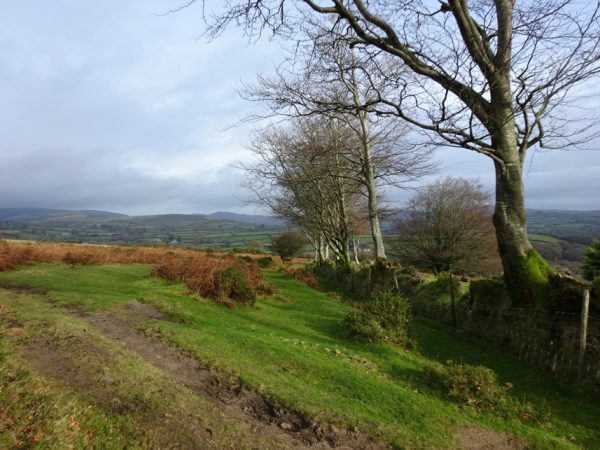 And Fiona Freshney, MTMTE’s new Moorland Bird Advisor, talked to us about some early indications regarding species health and population density derived this summer’s moorland bird survey. She also – very interestingly – talked about the relative merits of cattle and ponies as conservation grazers – it was good to hear that ponies come out on top! I ended the day suffering from a degree of information overload, and it’s been a useful (if lengthy!) exercise writing this blog post and trying to get my thoughts in some sort of order! Thanks to Mark and members of the MTMTE team for a fascinating day out.